St. Albert Curling Club - I started to register, but didn't pay in full. How do I pay my balance? I started to register, but didn't pay in full. How do I pay my balance? 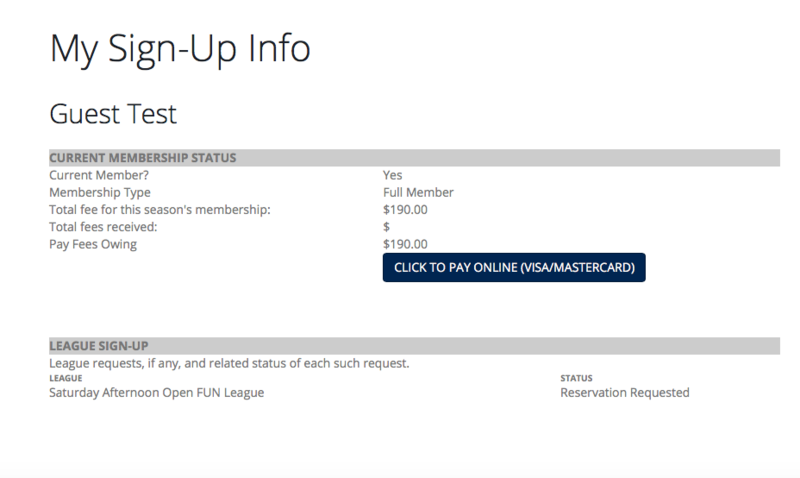 If you have completed your league signup and paid a deposit, or if you have signed up but not yet paid, you can pay your balance through the Member's Home menu: My Signup Info. You will land on the Member's Home page. From the Member's Home menu at the top of the page, choose "My Signup Info"
This screen will display the league(s) you have signed up for (listed as "reservation requested"), total balance, amount paid and balance owing. Click on the blue bar "CLICK TO PAY ONLINE (VISA/MASTERCARD)" and follow the steps to complete your payment.